Note from study reviewer, Peter Budnick: I facilitated a 1-day workshop last week (Advanced Ergonomics Analysis – Using Quantitative Ergonomic Assessment Tools) at the Oregon Governor’s Occupational Safety & Health Conference, and the topic of ‘lifting with your knees’ came up, which reminded me of this article we published in 2010. So, why don’t people ‘lift with their knees’ even if they are trained to do so? Why is ‘lift with your knees’ a weak and ineffective approach to ergonomics? This study gives us some useful insight on those questions (also see another of our recent articles related to this topic, Research Review: Value of Back Injury Prevention Training Questioned). In this study, the researchers Li and Zhang (2009) hypothesized that people whose back strength is greater than their total knee strength are more likely to adopt a back-lift strategy, and vice versa, and devised an experiment that considered the relationship between a person’s back and total knee strength, gender, self-knowledge of their strength, and the load weight on lifting strategy. Knowledge of strength feedback did not show a significant effect on lifting strategy. We’ve all heard it, and some may even be strong proponents of it: ‘lift with your legs, not with your back!’ The problem is, many or most people simply do not do so. This study looks deeper into why that is, and concludes that total (combined) knee strength vs. back strength is a significant predictor of how someone will choose to lift. Add this new knowledge to previous research that demonstrates that the physiological/metabolic demands of leg-lift strategies are far greater than those for back-lift strategies, that many items are too big/bulky to effectively use a leg-lift strategy, and consider the effects of knee function and injury, it’s no wonder few people follow the conventional wisdom advice. The authors suggest that these results can be used to justify training programs that focus on increasing knee strength. 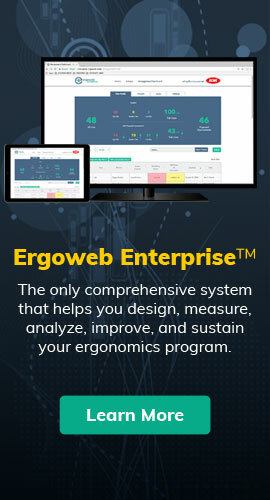 While such an approach, under strict conditions, may produce a sustainable change in lifting behavior, there is still no clear evidence that such behavior changes will translate into a reduction in back injuries, which is yet another challenge to the “lift with your knees” approach to ergonomics. However, rather than spending a great deal of time, money and resources trying to change people, which may or may not be successful, why don’t we focus on designing the system to better fit human capabilities, which will be successful? Why don’t we just get to the root of the problem? Why don’t we match the work to the people, vs. matching the people to the work? Why don’t we design our process so that lifting naturally occurs in the “power zone,” or the “strike zone,” meaning lifting close to the body near waist height? After all, this is also the most effective lift, reducing the time it takes to conduct the lift (reducing “movement waste” in Lean terminology) and reducing the likelihood of error (dropping, colliding with other equipment or people, etc. — “do it right the first time” in Lean terminology). The study is limited in the number of lifting tasks, the simplicity of the tasks, the number of personal factors studied, and only young and healthy participants were included. Lifting postures where captured using reflective markers and a 5 camera video system. This article is reprinted with permission from The Ergonomics Report™ Archives, where it originally appeared on November 10, 2010.